Arithmetic Circuits for DSP Applications is a complete resource on arithmetic circuits for digital signal processing (DSP). 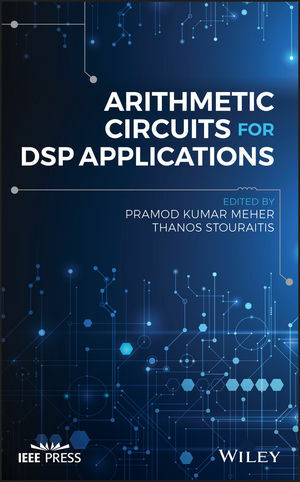 It covers the key concepts, designs and developments of different types of arithmetic circuits, which can be used for improving the efficiency of implementation of a multitude of DSP applications. Each chapter includes various applications of the respective class of arithmetic circuits along with information on the future scope of research. Written for students, engineers, and researchers in electrical and computer engineering, this comprehensive text offers a clear understanding of different types of arithmetic circuits used for digital signal processing applications. The text includes contributions from noted researchers on a wide range of topics, including a review of circuits used in implementing basic operations like additions and multiplications; distributed arithmetic as a technique for the multiplier-less implementation of inner products for DSP applications; discussions on look up table-based techniques and their key applications; CORDIC circuits for calculation of trigonometric, hyperbolic and logarithmic functions; real and complex multiplications, division, and square-root; solution of linear systems; eigenvalue estimation; singular value decomposition; QR factorization and many other functions through the use of simple shift-add operations; and much more. This book serves as a comprehensive resource, which describes the arithmetic circuits as fundamental building blocks for state-of-the-art DSP and reviews in - depth the scope of their applications. PRAMOD KUMAR MEHER is an independent hardware consultant. Previously he was a Senior Research Scientist with the School of Computer Science and Engineering at Nanyang Technological University, Singapore. He has contributed nearly 250 research papers including more than 75 papers in IEEE Transactions in the area of circuits and systems. He has served as Associate Editor for IEEE Transactions on Circuits and Systems and IEEE Transactions on Very Large Scale Integration (VLSI) Systems. Currently, he serves as an Associate Editor for the IEEE Transactions on Circuits and Systems for Video Technology and Journal of Circuits, Systems, and Signal Processing. THANOS STOURAITIS is a Professor of the Electrical and Computer Engineering Department at Khalifa University, UAE. He has previously served on the faculty of the University of Florida, Ohio State University, New York University, University of British Columbia, and University of Patras. He was named an IEEE Fellow for contributions in high performance digital signal processing architectures and computer arithmetic, and is a Past President of the IEEE Circuits & Systems Society.